(HARRISBURG) – The Pennsylvania Senate convened today in Harrisburg. During session, State Senator Joe Scarnati (R-25) was once again unanimously re-elected by members of the Senate to serve as President Pro Tempore of the Pennsylvania Senate for 2018. This is the twelfth time Senate colleagues have elected Senator Scarnati to the third-highest constitutional office in the Commonwealth. The Honorable Chief Justice Thomas Saylor administered the Oath of Office to Scarnati. 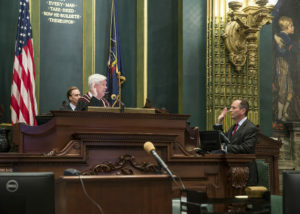 Following being sworn-in as President Pro Tempore, Senator Scarnati offered brief remarks. “I thank each Member of the Senate for their trust and faith in me to lead this Chamber. We have much that we can accomplish together in the coming year. Senator Scarnati is currently serving his fifth term in the Senate. He was born and raised in Brockway, Jefferson County, and represents the 25th Senatorial District, which includes Cameron, Clinton, Elk, Jefferson, McKean, Potter and Tioga Counties and portions of Clearfield County.